Rice Kernel goes to a language immersion program two afternoons a week. He often takes a cat-nap before the program – a necessary nap, I say. One afternoon, he skipped his nap so, naturally, upon picking him up at 3 p.m. he promptly fell asleep. Now, FHE and I have a rule: if you fall asleep past 3, you get woken up after about 30 minutes. Sounds cruel, I know. But if there’s any hope of my son going to be at a normal hour and staying asleep through the night, trust me, late afternoon naps must be limited in duration. On this particular afternoon, I was feeling generous. Okay, tired. I let him go about an hour. After taking the baby out of the car, I picked up Rice Kernel, brought him into the house and put him down on his feet. Then the crying began. I knew he was tired, but I had to wake him. Suddenly the cries turned to screams and shrieks. Great. I calmly asked what I could do to help him; if I could hold him or give him a cold drink. He screamed. I told him if there wasn’t anything I could do to help him, he could cry and calm himself down while I put groceries away and started dinner. So I walked away. And the ear-piercing screams began in earnest. I walked back, repeated myself. He said he didn’t want anything from me. Scream. This pattern repeated itself for about 30 minutes. Finally, the boy said to me (in between sobs): You hurt my feelings by walking away. Oh. But you didn’t want anything from me, I said. No matter, said Rice Kernel, I hurt his feelings. A few minutes later, the crying died down and he started being “polite” again. Suddenly, he said to me, are you cooking dinner? I said yes. 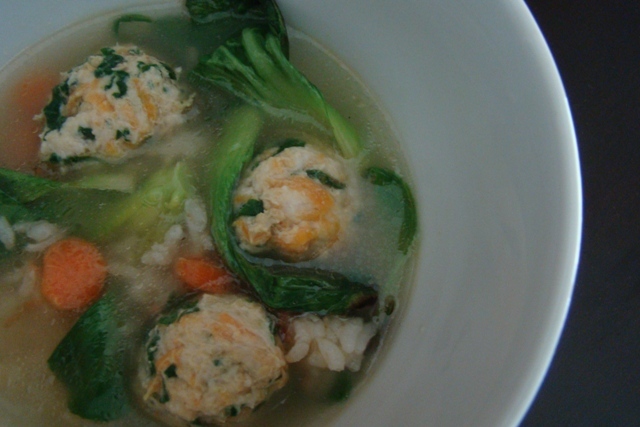 He said, “Do you think you can make chicken meatballs in soup?” So that’s what inspired this dinner. And it was a delicious dinner – a versatile and quick one I will probably turn to again. One I won’t soon forget. Mix the first 6 ingredients together and form into meatballs. In a stockpot, bring stock to a boil and drop in meatballs. Cook until thoroughly done, add rice and vegetables and simmer until vegetables are tender. 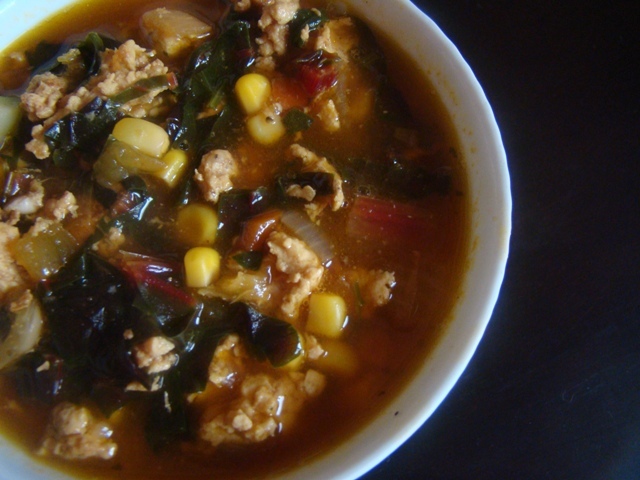 This is a hearty recipe that is perfect for chilly nights. Unlike more traditional oxtail soup recipes, this one features full-bodied, spicy coriander, cardamom and cumin with a touch of sweet cinnamon. It freezes beautifully and is a welcomed meal on any winter night. Note: If you prepare the dish and then refrigerate it, an oil layer will coagulate at the top. Simply spoon it off and reheat for a healthier dish. If you’re preparing this recipe in a Dutch oven, preheat your oven to 200 degrees F. If you’re using a slow cooker, get it ready by plugging it in and setting it to its lowest setting. Brown the oxtail in a very hot pan. Remove to a large Dutch oven or slow cooker. Add the olive oil to the pan you browned the oxtail in and turn the heat to medium. Once the oil shimmers, add the onions and cook, stirring occasionally, making sure to scrape along the bottom and get up all the meaty bits that stuck to the pan while you were browning the meat. Cook the onions just until they start to brown, about 5 minutes. Stir the garlic and ginger into the onions and cook for another minute, until the garlic and ginger become extremely fragrant. Pour onions, ginger and garlic into Dutch oven on top of the oxtail. Pour the can of tomatoes into the same pan you cooked the onions in again scrap the bottom to get up anything stuck to the pan. Add coriander, cardamom, cumin, ginger, salt and pepper, stirring well. Cook tomatoes over medium-low heat for 5 minutes, just until it begins to thicken, stirring occasionally. Add beef stock to tomatoes and continue to cook until it comes to a simmer. While you’re waiting for the tomatoes and beef stock to heat up, add the carrot, parsnip, potatoes, yam, apple and kidney beans to the Dutch oven or slow cooker and mix well with the oxtail and onions. Once the tomatoes and stock are at a simmer, add them to the Dutch oven or slow cooker. Give the whole thing a good stir to make sure the sauce covers everything, cover with a lid, and set to cook. For a Dutch oven, place it in your 200 degree oven and let cook undisturbed for 8 hours. 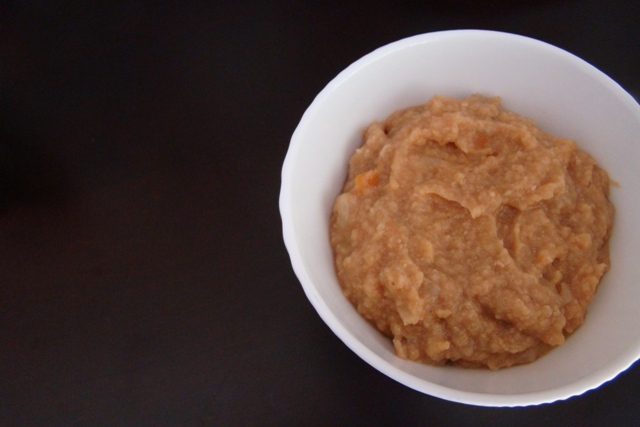 If you’re using a slow cooker, turn it to the “LOW” setting and let cook for 8 hours. Serve hot, garnished with fresh parsley. 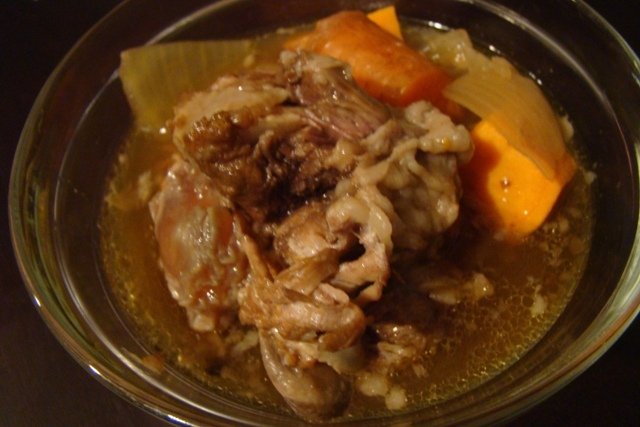 I serve my oxtail soup with the bones in because I’m too lady to pick them apart before serving – plus I think the bones add to the rustic feel of the dish. If you’re so inclined, feel free to pick out the bones before serving. Our December and early January were filled with sunshine and warmth. Sometime in mid-January, it finally started raining… for days in a row. Wishing for some warm comfort food, I thought of congee. Delicious for breakfast, lunch, and dinner, it is a nutritious meal anytime of day. And the best part is, you can add whatever toppings you wish! Wash rice until the water runs clear. Marinate the beef for 10 minutes. Heat large stockpot over med-high heat with a few teaspoons olive oil. When hot, add ground beef garlic. Fry until ground beef is browned. Add the stock or wate and rice. Turn heat to high. When boiling, immediately turn heat to low. Simmer 40 min. Taste and adjust with soy sauce and pepper.